Owen and Ben Franks formed a formidable partnership in the Crusaders front-row and continued their form onto the international scene. 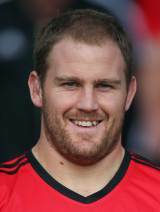 Ben Franks joined Canterbury in 2005 and although he changed to Tasman in the ITM Cup - he remained an essential part of the Crusaders side. Following the brothers' call-up to the national side in 2010 for their matches with Wales and Ireland they became the first siblings to play for New Zealand since Robin and Zinzan Brooke. Ben marked his debut for the All Blacks with a try against Ireland but has found himself on the fringes of the first XV recently. However, he went into the World Cup in the 30-man squad alongside brother Owen and made four substitute appearances during the tournament.